“Something is different about Sabrina.” Netflix just released a new trailer for the continuation of the first season (aka part two) of Chilling Adventures of Sabrina. 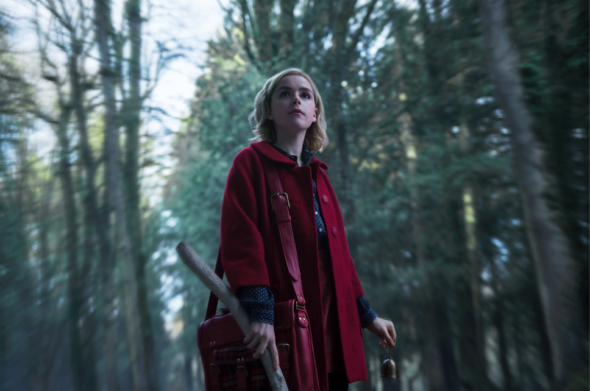 Based on the Archie Comics’ character, the supernatural series centers on Sabrina Spellman (Kiernan Shipka), a sophomore at Baxter High in Greendale (a town near Riverdale), who is half-mortal and half-witch. The cast also includes Ross Lynch, Lucy Davis, Miranda Otto, Chance Perdomo, Jaz Sinclair, Michelle Gomez, Gavin Leatherwood, Richard Coyle, Lachlan Watson, Bronson Pinchot, Tati Gabrielle, Adeline Rudolph, and Abigail Cowen. Part two of Chilling Adventures of Sabrina premieres on Netflix on April 5th. What do you think? Are you a fan of Chilling Adventures of Sabrina? Will you watch the new episodes? I can’t wait..best new show on TV on any ‘platform’. The one show that doesn’t pull any punches. This looks even better than last season!!! I know trailers are deceiving but this looks so good! Can’t wait to see what happens! Yes, I am looking forward to the new season of Sabrina.